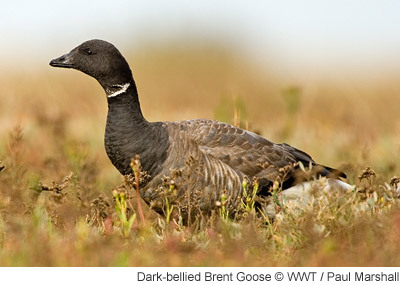 There are two subspecies of Brent Goose which regularly occur in Great Britain and Ireland. The nominate subspcies Branta bernicla bernicla, known as Dark-bellied Brent Goose, is found at estuarine sites in eastern and southern England and southern Wales. The subspecies B. b. hrota, or Light-bellied Brent Goose, comprises four recognised biogeographical populations, two of which are found in Britain and Ireland: the East Canadian High Arctic Light-bellied Brent Goose occurs primarily around Irish coasts, and the East Atlantic Light-bellied Brent Goose is found mainly at Lindisfarne, Northumberland.